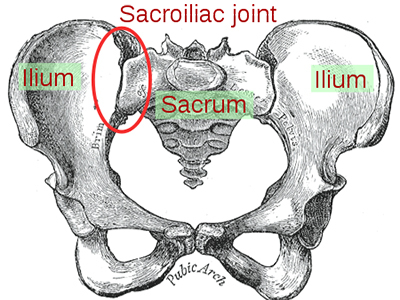 The sacroiliac joint is formed by the articular surfaces of the sacrum and the iliac bones in the pelvis. Besides the boney structures, various ligamentous attachments are present to further stabilize this important joint. It is a true diarthrodial joint. The articular surfaces of the joint are ear-shaped. They contain irregular ridges and depressions. From a functional standpoint, the joint is a shock absorbing joint that works as a pivot in transferring weight from the upper body to the lower extremities. It is thought that the pain in the SI joint is caused by ligamentous or capsular attention, extraneous compression or shear forces, joint hypermobility, or myofascial pain-causing inflammation. Besides arthritis ligamentous, tenderness, fascial attachment accumulating as a soft tissue injury can be a source of pain discussed further in the dorsal aspect of the SI joint. Thankfully, Sacroiliac Joint Mediated Pain treatment is offered here at Innovative Pain Solutions. Symptoms include a dull or a sharp pain that feels like originating from the lower back or the hip and can radiate into the buttocks, thighs, or groin. Certain activities like running out a common cause of SI joint mediated pain. According to a study by Ha, et al, lumbar fusion surgery patients have a higher incidence of pain originating from SI joints. The diagnoses of SI joint mediated pain is for the most part, a clinical diagnosis. It is diagnosed based on presenting symptoms, and on physical examination by using provocative tests like compression of the SI joint and Faber test. Conservative treatment is the first recommended treatment option for most cases of sacroiliac joint mediated pain of the spine. -the goal is to avoid aggravation of the inflamed sacroiliac joint. – avoid activities e.g. running, walking uphill. 3 Exercise and physical therapy. 4 Application of heat and or ice. 6 Sacroiliac joint steroid injection. If you are in need of Sacroiliac Joint Mediated Pain Treatment please give Innovative Pain Solutions a call today to be seen by our pain specialist Dr. Kalia.